One thing you learn from travelling is that what people like to eat for breakfast varies wildly by culture. This means that in multi-ethnic Singapore there are multiple traditional breakfast options available at hawker centres across the island. No, that’s not a butter sandwich — it’s kaya toast and kopi. 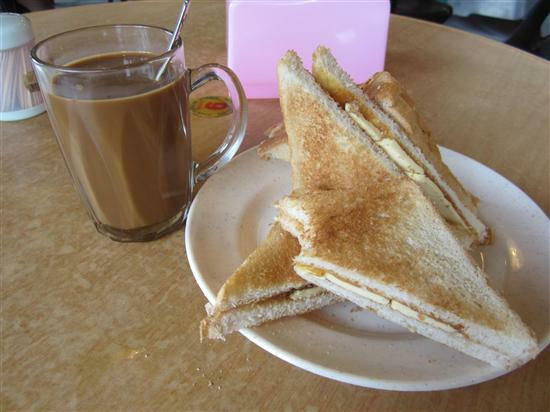 The most uniquely Singaporean breakfast and one that should be semi-recognisable to Westerners is kaya toast. Kaya is a sort of jam made from coconut, egg and pandan leaves (which taste slightly like vanilla) and is served on toasted bread with a thick layer of margarine. If you like to start the day with a hearty breakfast while sticking to a budget, a set of kaya toast, soft-boiled eggs and Singapore-style kopi (coffee) or tea will set you back about S$2.50 at a hawker centre. When it comes to Chinese food generally speaking there isn’t a clear distinction for which foods should be eaten at which time of the day, and fish ball noodle soup, yong tau foo, bee hoon (fried noodles) and dim sum are just as commonly eaten for breakfast as they are for lunch. If you’re a light eater in the morning, try you tiao, Singapore’s version of a doughnut. These fried sticks of dough are best when dunked in a sweet cup of kopi. Indian breakfasts are just as spicy as Indian lunches and dinners. 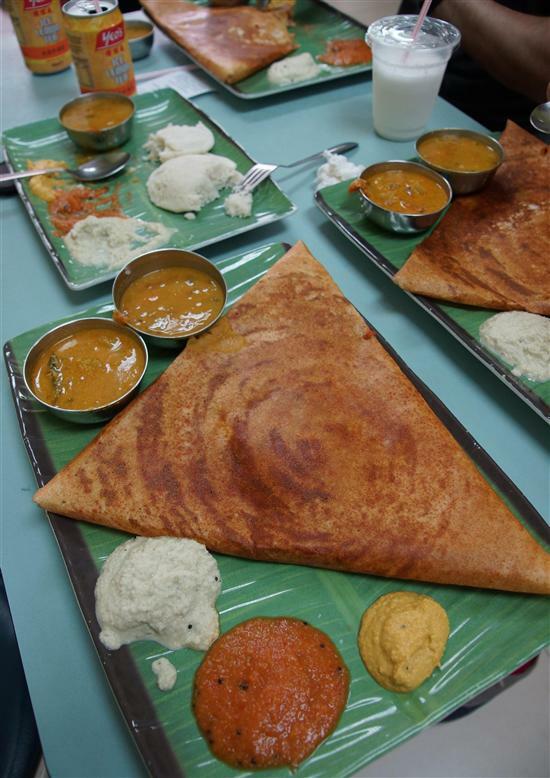 Singapore’s Indian community originates from the southern regions where the food tends to be vegetarian and spicy – even in the morning. Traditional breakfast items are idli (small savoury cakes), appam (small savoury pancakes) and thosai (large savoury pancakes, often with a filling). Though the textures differ, the taste is similar as they’re all made from a base of rice and lentil flour and served with the same spicy dips on the side called sambar. For a complete breakfast, wash it down with a cup of sweet masala tea or a mango lassi (yogurt drink). The saying “breakfast is the most important meal of the day” must have originated in Malaysia, as Malays traditionally start the day with a hearty meal of nasi lemak. Literally meaning “fatty rice”, this meal of coconut rice, fried anchovies, egg and peanuts with a side of sambal (chilli sauce) definitely has enough calories to last you through lunch. For breakfast to-go, look for nasi lemak being sold wrapped in banana leaves.